Re-reading some of my recent posts I apologize for too many spelling errors, typos or bad orthographics which may wreck the general impression of said posts. Proof-reading HTML-edited posts is a very tiring but nevertheless most important task. I vow to improve. Gold sales for investment purposes have grown up to ten-fold in some countries, the World Gold Council, announced on Wednesday in its latest quarterly report. Fears of future inflation and ongoing financial uncertainty saw investors continue to flock to gold in the first quarter of 2009, seeking out its proven wealth preservation qualities. Total demand for gold in Q1'09 rose 38% year on year to 1,016 tonnes, representing a 36% rise in value terms to US$29.7bn. According to figures published today by World Gold Council (WGC) in its Q1'09 Gold Demand Trends report, identifiable investment demand for gold, which includes exchange traded funds, (ETFs) and bars and coins, was the major source of growth in the quarter, reaching 596 tonnes, up 248% on Q1'08. The figures, compiled independently for WGC by GFMS Limited, reveal a record level of investment into ETFs with demand soaring 540% to 465 tonnes at a value of US$13.6bn. Net retail investment (total bar and coin demand) remained highly robust, rising 33% year on year to 131 tonnes, despite some bar and coin dishoarding in eastern markets as investors took profits. Germany was the single biggest bar and coin market in Q1'09, where demand rose 400% on Q1'08 to 59 tonnes, with inflation concerns being a key buying motivator. Switzerland was the second largest bar and coin market, up 437% to 39 tonnes on Q1'08, followed by the US, rising 216% to 27.4 tonnes. Austria saw a 12-fold increase from 1,9 to 22,7 tons. The Austrian Mint works 3-shifts, 7 days a week. The impact of the recession on consumer discretionary spending continued to take its toll on both jewellery and industrial demand. Gold jewellery demand was down 24% on year earlier levels, with most countries suffering a decline as consumers responded to the high and volatile gold price, which reached record levels in some countries, compounded by difficult economic conditions. China bucked this trend recording a positive 3% growth in jewellery demand. This reinforces the view that China's economy, although unquestionably suffering from a sharp deceleration, nonetheless remains resilient relative to most other nations. Total demand in India, traditionally the world's largest gold market, declined significantly under pressure from record rupee prices and a major deterioration in the domestic economy. Demand fell 83% on year earlier levels to just 17.7 tonnes. Industrial demand for gold in Q1'09 was 31% down on Q1'08, with the electronics sector being the major contributor to this decline. End user demand for electronics goods has been badly affected by the downturn in consumer spending on items such as laptops and mobile phones. 'There has been a seismic shift away from capital appreciation towards wealth preservation and we believe this trend will define investment behaviour in the next decade. Gold, as one of the few assets that has held its value during the current economic crisis, has been sought out by investors who are drawn to its proven protective attributes as well as safeguarding themselves from the erosive effects of future inflation. Demand in the Middle East in Q1'09 was down 26% on Q1'08 to 53.6 tonnes. Both jewellery and investment recorded similar declines in percentage terms (-26% to 49.5 tonnes and -28% to 4.1 tonnes respectively). With 90% of total consumer offtake in the region in the form of jewellery, this decline was largely down to the combination of the high gold price and a tightening of consumer spending. In the US, total demand for gold was 15% higher than in Q1'08 at 55.2 tonnes, driven by retail investment demand which rose 216% to 27.4 tonnes. Conversely, difficult economic conditions continued to weigh heavily on jewellery demand, which fell 30% to 27.8 tonnes. Total supply surged 34% on the same quarter last year to reach 1,144 tonnes in Q1'09. With a 55% increase on Q1'08 to 558 tonnes, the primary source of the increase was scrap gold coming back into the market as high prices and difficult economic conditions encouraged record levels of recycling. Also contributing to the increased supply was a sharp slow down in the levels of producer de-hedging (from -129 tonnes in Q1'08 to -10 tonnes in Q1'09). Mine production was relatively stable, increasing by just 3% to 560 tonnes while lower levels of central bank sales, which fell 54% to 35 tonnes, had a dampening effect. The full First Quarter 2009 Gold Demand Trends report can be viewed here. As my first attempt to get a list of current shareholders of the semi-private Federal Reserve in late 2008 did never yield an answer I sent an inquiry to the Federal Reserve Board (FRB) today. As this is still the most important institution in terms of influencing markets I wonder why the Fed does not publish this extremely important piece of information that could provide valuable information about who really pulls the strings in an organisation which uses two different suffix on the web. The server of the Federal Reserve is named "federalreserve.gov" whereas the FRB's server is registered as "frb.org" (corr.27/5/09/ . The only lists of shareholders of the Fed found on the web through a Go-ogle search are hopelessly outdated and appear to stem from the first half of the 20th century. Or is anyone still doing business with Chase National? "The plan adopted in the original Federal Reserve Act called for the creation of a System that contained both private and public entities." The Federal Reserve Act was pushed through on Capitol Hill on December 23, 1913 after a secretive meeting of the USA's bankers elite on Jekyll Island. I have a very simple question: Where can I find a list of current shareholders of the Federal Reserve? On the web I only find hopelessly outdated lists that seem to stem from the first half of the 20th century as most of these institutions are not in business anymore. Can you please provide me with a current list of shareholders and the number of shares they are holding? I have filed this question in autumn 2008 as a general inquiry but never received any answer so far. My second question concerns the status of the Federal Reserve as there is a server name "federalreserve.gov" but also a server name "FRB.org." Is it a private or a public institution? My third question is why the shareholders of the Federal Reserve receive a guaranteed 6% dividend that is not taxable? I am most grateful for an answer. I am curious as to whether I will get an answer to one of the most important questions regarding capital markets. In order to find truth one usually has to follow the money trail. Let's see where I get. In case I am not getting an answer I am calling all bloggers and everybody else to use the said form so that the Fed recognizes that transparent markets need to be transparent in terms of ownership in the first place and the broad public has a vital interest whether it was private or a public organization whose loose monetary policy and the rejection to regulate markets effectively have led to the biggest economic and financial crisis in mankind's history. The Fed is certainly the most privileged institution in the world, only having to give testimony on Capitol Hill twice a year and getting away with "missing" $9 TRILLION. Isn't all this a conundrum? It is! Are you tired of the continuous stream of bad news that fill all news and information websites? Recession blocker might just be what you are looking for to go back to the time when it was much more enjoyable to read news. Check it out. As I read more and more about EU politics thanks to this EU blogging initiative, which provides me with a good insight on the issues in the other 26 member countries I am becoming more and more enraged. Digging through the wealth of information on the EU’s official websites and after reading the Lisbon Treaty in full (find it here in your preferred language) I am more ambivalent than ever because the way to this complete overhaul of the EU’s inner workings lacks too much in terms of a truly democratic process. We the people are certainly not the ones who can influence our very own political future, being overridden by our own governments. France and the Netherlands had both voted against the treaty, but the decision of some 80 million EU citizens in these 2 countries against the Lisbon Treaty was overruled by their very own governments who were elected to represent the interests and the will of the sovereign, that is the citizens. My last hopes lie with the German constitutional court who will publish his decision on the Treaty only after EU elections. I am calling on all Irishmen and -women to clearly signal the EU at the second referendum in September that is has to become an institution that follows the will of the sovereign if it does not want to risk major social unrest in the time of the worst global economic crisis since 60 years. The arrogance of the EU not to accept the sovereign’s decision in 3 countries is unacceptable. In my country Austria the sovereign was not even asked about its stance on the Lisbon Treaty with a heavy focus on the interests of business and the warmongers, while lacking a social charta that deserves that name. People are not as stupid as incompetent politicians on the supranational and national level want to believe. Sensing a more aggressive tone in the only news sector not filled with blatant lies and politicians lala-gobbledygook, the blogosphere, I would say the gloves are coming off in the discussion of our future. Driving the Irish to the polls again in September is certainly not democratic. It is a clear sign that the EU council, which is not elected by anyone, gives a you know what about the sovereign’s will. Read these older posts. Being a history buff I am also most skeptic when leaders tell their people that there is only one possible way. Hitler did it in the 1930s (reminder: he was elected before starting his tyranny that cost probably more than 25 million people in Europe and Russia their lives.) Sorry, only rookies, dictators and tyrants have no plan “B.” If you don’t like this very cynical comparison, prove me wrong in comments - without being polemic - please. Every business, from the one-wo/man graphics design bureau to multinational corporations has to have at least 3 scenarios (best, average, worst case) on their economic future or they would be laughed out of the bank when trying to aquire new funds for an expansion of their firm. to discredit the pan-European libertas party - linking them to shadowy characters - I consider a principal discussion of the EU style of democracy much more urgent than anything else. the establishment of a EU foreign minister (the sovereign in the smaller countries has probably very different interests than those countries that partook in former US president Bush’s “coalition of the willing.”) Don’t try to tell me this is will be a peacekeeping force. We have this at the global level already, with UN soldiers and the bloody history of corruption, human trafficking and other issues that are far far away from the law I respect most, but which is trampled on by so many Western countries by now. EU commissioners Juan M. Barroso’s dangerous visions cannot be displayed often enough. Watch the long version of his statement about an imperialist EU that has a (negative) historical dimension. Empires always waste the lives of a sovereign turned into cannon fodder. The American Indians may not have known the wheel, but they dissolved conflicts by having the tribal chiefs fighting each other with their communities onlooking. No lives got wasted this way. When I voted yes for the EU in Austria in 1995 I voted for a European Community. Now I find myself in a union nobody has ever asked me about whether that is my will. Can anybody help me with the question whether the EU is really democratic? In 1987 I compiled an executive briefing for the Austrian Trade Union Congress ÖGB. At that time the EEC (European Economic Community) would not have been able to join itself because of lacking democracy. Is this still the case? Following EU politics I think it still is the same. After all the EU council still can overrule the EP (European Parliament) so easily as they decide on political milestones at their regular meetings. The EP certainly has an image problem stemming from the length between their decisions and the ratification in all 27 member states that can take up to 2 years. Nobody has such a long attention span. Putting all internet assistance aside the only EP decision that made it to my ears/eyes is the limit for international roaming fees charged to mobile phone users. But how many normal people, who have 5 weeks or less time to vacation every year, are really helped with this legislation? This may be very interesting for EU officials jet-setting between Brussels, Strasbourg and their homecountry, but the rest? The internet savvy generation has long discovered that email dispatched in a cybercafe or vocal communication via Skype is much much cheaper than those new limits on roaming fees promise. This leads me to my last pricipal issue. With 27 member states there are certainly more than just one approach on issues. Being a smoker who was turned on to cigarettes by unlimited advertising in the 1970s (gorgeous woman surrounding cool guys) I take the mad rush towards a smoke-free world as a good example that the EU would be better advised to respect the personal freedom and the sovereignty of my body. Then I was forced to shell out more and more money because the state raised taxes to the point that more than 70% of a pack’o fags’ price lands in the government’s empty coffers. Now they attack my health a second time with outlawing smoking in many more places so I have to leave buildings regardless of the bad Austrian weather, risking a cold in the process. I know enough members of the hospitality industry that complain about sharply falling revenues because smokers can no longer socialize in their former favorite venues. All this because some anti-smoking zealots drive their ruthless agenda forward. Take a look in Paris. Isn’t it perverse that you cannot smoke in a Bar Tabac? Where would Jean-Paul Sartre, Simone de Beauvoir, Serge Gainsbourg and Andre Glucksmann convene nowadays? I see the same picture all over Europe by now. As roughly a fourth to a third of Europeans still smoke despite high taxes (just check out the well filled smokers section in the Brussels EU headquarters) I cannot understand that we need a regulation where the free market had found a working solution. It should be left to the restaurateur/bar owner etc. to decide on this issue by her/himself. Smokers visit their smoke-filled cafe/restaurant of choice and leave the same right to non-smokers in choosing where they go out. Don’t tell me all places have to be accessible for everyone. Applying the same rigid standards the EU does with non-smoking would mean that all restaurants have to have the same menu in order not to discriminate against somebody. Well, I do not need to go to every restaurant. I prefer those where I can enjoy a meal and the cigarette/cigar afterwards. If this were really about health politics the EU has a much more pressing problem with alcohol. Harmful alcohol consumption is estimated to be responsible for approximately 195,000 deaths a year in the EU, due to e.g. accidents, liver disease, cancers etc. Harmful alcohol use is the 3rd biggest cause of early death and illness in the EU, behind tobacco and high blood pressure. More than 1 out of every 4 deaths among young men (aged 15-29 years) in the EU is due to alcohol (often caused by road traffic accidents, homicide, violence etc) and 1 in every 10 deaths among young women. If the EP is a representative cross-section of 300 million EU citizens, 1 in 6 MEPs has an alcohol problem. Talk to a politician and he will tell you that we have a “drinking culture” in Europe. 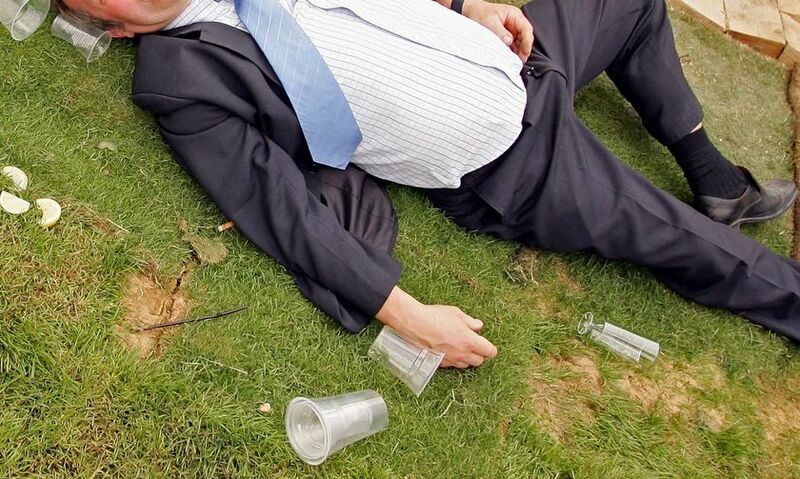 PHOTO: One of 55 million EU citizens with an alcohol problem called "drinking culture"
Go here for pictures of binge drinking among the younger generation that will direct the EU’s fate in the future. Please tell me more about the alcohol “culture” we have in Europe. Find a treasure chest full of information on this Euractiv.com webpage with many more links concerning this “culture” whose total social cost is estimated at 1.3% of the EU’s annual GDP (gross domestic product), equivalent to the costs of smoking. With more than 300 million citizens - each of them an individual with his very own political interests - I consider it a very bad mistake that the EP tries to dress us with only one suit of regulations. Democracy means to tolerate different points of view. Heavily indebted Europe has almost no energy or commodity resources, putting us at the mercy of the Chinese who buy up everything all over the world. The future demographic development with a flip-flop of the age pyramid will force us to roll out the red carpet for “economic refugees” and asylum seekers, spoon-feeding us in senior’s residences. Labor unit costs are still the highest in the world. Enough for today, I will come up with more examples of hypocrisy in the EU next week. And now, PLEASE comment, comment, comment! NOTE: This article gets cross-posted at TH!nkABOUTIT, an EU blogging initiative in the runup to the EP elections from June 4 to June 7. As hyper-inflation becomes a mass fear of destruction technology not only helps to create freshly digitized money (we would have no tree left standing were it all to be printed) but also offers coloured pictures for the first time. Here is a picture from the "good old times" I wrote about in 2005. Germany, ruined by its loss of WW1 started a process called "monetizing the debt." At the end of hyperinflation 99% of government revenue came fresh off the numerous printing presses running hot and only 1% from tax revenues. Troy Ounce (hat tip) published this new picture. Doesn't it look great in colour? Hyper-inflation goes 3rd millennium. Who will become the next nation of billionaire beggars? It is a mystery to me how the old media can miss out on some major scoops Tyler Durden (pseudonym) publishes on an almost daily basis at his blog Zerohedge. and I am confident you will add them to your daily reading. Unshrouding the secrets in America's economy gone bonkers I only wonder how this blogger pushes out high quality post after high quality post. Does he ever sleep or is it a group of experts? Attention all blog readers/raters/reviewers/aggregators! Naked Capitalism deserves the same praise. Do you have the same problem in deciding who you will cast your vote for in the EU parliamentary elections in the first week of June? I dug myself through the political promises of all Austrian parties competing in the EU parliamentary elections in the past weeks, scrutinizing their agendas for European policy in the next 5 years. I have to admit I did not waste my time with the 2 far-right nationalist contenders FPÖ and BZÖ as nobody could be farther away from my political opinion. I don’t even want to honour them with a link to their sites. If they deem it necessary they shall go blog themselves. Condemning any form of racism, xenophobia and supremacist ideologies this reduced my voting choices to the other 6 parties. did not help my decision process. Having attended the curtain rising event of the Social Democrats I was delighted to see that the term class warfare has found its way back into the semantics of the party that had changed its name from Socialists to Social Democrats in the last millennium while being led by a bank CEO. As their hypocritical tactics say “no more taxes” on the one hand, the other hand was busy in the last 8 years to raise prices for federal, state and community services. (isn’t this what we are paying taxes for?) This is highly biased towards their loyal constituency, consisting mainly of public employees and farmers. A deep rift within the Conservatives showed up when they nominated former interior minister Ernst Strasser as their top candidate, putting old-hand MEP Otmar Karas only in second position. This resulted in an outcry from all former ÖVP party heads who rejected to form an election committee for him. Strasser is the architect of Austria’s “Sicherheitspolizeigesetz” (literal translation: police may do almost anything without a warrant) and also rushed a law on online surveillance in a coup-like style through parliament in December 2007. Without going too much into detail; the Nazis would certainly have liked his strategy of throwing a total surveillance net with today’s technical possibilities over this small neutral country. While I can sympathize with the Greens for the fact that they try to revoke the shift to a police state that has been ongoing in Austria since the beginning of the new millennium, I have my problems as they have a blind spot in terms of an economic policy. Their constituency consists mainly of the younger generation who cannot find enough truly social engagement within the SPÖ and affluent older voters who mainly worry about costly biological food. I ticked off the young liberals as well, as their agenda focuses mainly on student’s issues. I am past that age but maybe my teenage daughter is interested in them. Having seen enough election promises that were not fulfilled later, I am very wary for whom I should cast my vote. A little more web surfing resulted in finding a truyl useful help for my decision process. Wahlkabine.at (polling booth) part of the international network Vote Match Europe with partners from 11 European countries offers an online survey that can be done in a few minutes. They also offer an English version for those internationalists that want to give it the Austrian try. Listing 25 questions concerning the agenda of the EU parliament ranging from issues such as whether the EU should employ military forces to fend off African boat people looking for a better opportunity in life than their continent can offer (with a Czech last name, my predecessors were certainly economical refugees who came to Vienna in search of a more human life 100 years ago) to the issue whether I would want to vote for MEPs from other countries. I like this one especially as this method would certainly be a better idea to further the pan-European process. The results of my choices at the wahlkabine website were a big surprise for me. I ended up with the Greens in the top position who could score 289 points with me. The Communists came in a close second with 273 points. I was astonished to see the Social Democrats coming in with only 13 points on place 4, behind Liste Martin. The Conservatives followed on fifth place with a mere 9 points. And I am proud that xenophobic FPÖ was left in the dust with minus 59 points. NOTE: This post gets crossposted at TH!INKABOUTIT.EU, a EU blogging initiative in the runup to the EU parliamentary elections from June 4 to June 7. As I see uncountable search engine inquiries with the phrase "monetizing the debt" landing at this blog I begin to realize there is a huge void of knowledge not only amongst interested economic laymen but also among employees from what were highly prestigious financial institutions only 2 years ago. Let me fill in with the executive briefing version. Commercial banks with executives searching the web for an easily understood explanation of the said term and no idea about monetary inflation either, but a perfect understanding of their contracts sweetened with lavish bonuses, no matter whether they remain prudent or crash the cart against the wall. In contrast to all commodities unbacked fiat money is created at virtually no cost. This is most comfortable as it means the central bank computer can keep the party going. All that needs to be done are a few keystrokes (maybe they already have macros for the task) and a screen wide enough to accommodate the ever growing number of zeroes after the $/€ sign. So they enter a number, e.g. €60 billion as the ECB will do somewhen in the coming weeks, and wire this digitally created money to the commercial banks who in return hand over other serious looking papers that are called "securities" as collateral. 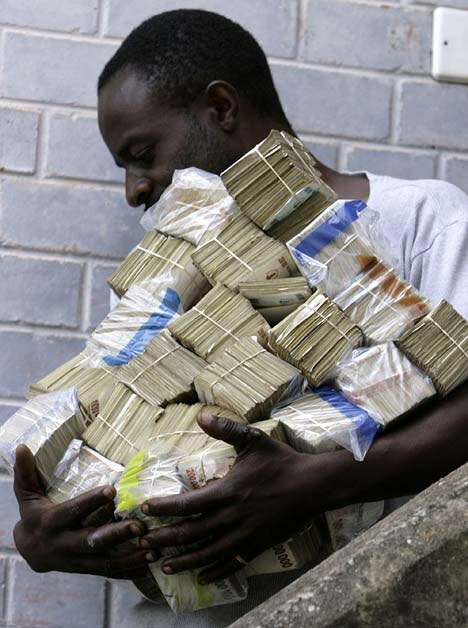 In our fractional reserve banking system banks can use this central bank money to hand out ten times as much in loans. For 10 money units lent they have to hold one money unit as "reserve," just in case some investors want their deposits back. It truly is a thrilling business: Put one money unit in the cash register (for which they currently pay 0.25% (Federal Reserve Notes) to 1% (Euros), let the borrowers come in and lend them 9 money units at anything between 5% (mortgages) to 12% (business loans.) You do the math yourself. It is virtually impossible not to turn a profit, weren't it for the rocket scientists with their Excel spreadsheets who think about new ways (derivatives!) on how to produce still more income that will be paid to them in form of a bonus. This is why the bankers drive Ferraris, but rarely their customers. If you now wonder, what this has to do with "monetizing the debt," you are right. It doesn't. But it explains that banking would be such a surefire business, had they not hired mathematical whiz kids who came up with those derivatives Warren Buffett calls "weapons of financial mass destruction." So here we go again: As it didn't cost the central bank more than a few cents to create this money/credit but the unknowing hard working public will accept it as compensation for their labour, we are already a step further in the Ponzi scheme called fiat money creation. Now the politicians have to act plainly ignorant (which should not pose a problem for most of them) and develop still more ambitious spending projects. As their Keynesian advisers had told them that a slowing economy is best countered with stimulating spending they scratch their heads, wondering where the money will come from. Their advisers had missed out on telling them that John Maynard Keynes had also recommended to build reserves during the good economic times. Diabolic help arrives in the form of a delegation from the central bank that will offer a solution so easy that the politicians immediately jump on their bandwagon. "If you issue a bond we will buy them for the amount you write on your piece of paper," whispers the pin-striped central banker into the finance minister's (treasury secretary) ear. The politician is jubilant now as this appears to be such an easy game with winners only. So the Treasury prints a government bond and writes, let's say 100 billion on it. As the economy has slowed for reasons that fill the long evening discussions of economists, without reaching a decisive answer, potential investors have no more money left to buy this bond. So the central bank creates this wonderful stuff called MZM (Money Zero Maturity) or unbacked central bank fiat money and "buys" (hahaha) the bonds for itself. The state turns around, starts new "growth projects" and is comfortable as it watches the mere mortals without any macroeconomic education working hard in order to get a part of this funnily coloured money. This game usually lasts for a few years before the broad public starts scratching its heads. They begin to see (or gut-feel) a recurring scheme: Public projects fill almost everybody's wallets but prices are ratcheting up too. That's called monetary inflation as the quickly rising amount of fiat money is spread over a slower growing amount of produced goods and services. Politicians, eager to keep up economic growth in order to get reelected, will want to keep the game going and issue the next bond, confident that their central bank will - hahaha - "buy" the next issue again with the next round of freshly created fiat money. This game could go on and on if there were no rational and prudent private bond buyers around. As in every Ponzi scheme the only disturbance arises once these prudent investors want their money back. As the state has no money it will beg the central bankers for the next shot in the arm. This usually works as the central bankers know they are in the end at the mercy of the politicians. The end of the monetizing the debt game is always the same. This time it will be the Chinese who have amassed so many FRNs (look at a greenback: it nowhere says US dollar!) that they will cozy up to the idea of throwing all their FRN holdings on the market in exchange for some real assets like commodities because the FRNs are only backed by future tax income. But in a recession this tax income shrinks too and therefore this backing is worth less and less. NOTE: Nothing is more difficult than explaining high finance in simple terms. Please let me know in your comments whether this attempt (after busying myself with the subject since 2001) was useful to you. I will strive to improve as this is the single most important issue in the process of ruining a country.